Around 1848, in the USA, the attention was drawn towards several strange phenomena that consisted in noises, raps and motion of objects, of unknown causes. Those phenomena happened frequently, spontaneously, with a singular intensity and persistence; however, it was also observed that they occurred particularly under the influence of certain persons called mediums, who could somehow provoke them at will, thus allowing the repetition of experiments. Tables were mostly used for that matter; it is not that they might be more favorable than another object but only because they were mobile, accommodating, and it was easier and natural to have people seating around a table than any other piece of furniture. By this way the rotation of the table was observed, then the motion in all directions, hops, reversions, fluctuations, violent knocks, etc. The phenomena were designated, in principle, with the name turning tables or dancing tables. Up until then the phenomenon could be perfectly explained by an electric current or magnetic flux, or by the action of an unknown fluid, and this was, as a matter of fact, the first formed opinion. But it did not take long for one to acknowledge the effect of intelligent effects in those phenomena; thus the motion obeyed a given will; the table moved to the left or to the right, towards a designated person, stood on one or two feet under command, knocked on the floor for a requested number of times, knocked regularly, etc. It was then evident that the cause was not purely physical and from the axiom: if every effect has a cause, every intelligent effect must also have an intelligent cause, it was concluded that the cause of those phenomena should have intelligence. What was the nature of such intelligence? That was the open question. The first idea was that it could be the reflection of the intelligence of the medium or of the observers, but experience soon demonstrated that it was impossible, since effects completely beyond the thoughts and knowledge of those present, and even in contradiction with their own ideas, will and desire were produced; hence it could only belong to an invisible being. The means for certification was very simple: All it was required was to initiate a conversation with that entity, achieved by a pre-established number of knocks, meaning yes or no, or designating the letters of the alphabet; thus a number of answers were obtained to several questions addressed to them. 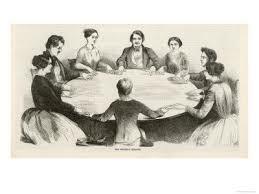 The phenomena were then designated by the name of talking tables. All beings that communicated in such a manner declared to be Spirits, belonging to the invisible world. As it happened to be a kind of phenomena that took place in a large number of places, by the intervention of different persons, and observed by very serious and educated men, it was not possible that it would be a game of illusion. From America, the phenomena moved to France and the rest of Europe where, for a few years, the turning and talking tables were in fashion and became the fun plays of theaters; then, when people were tired, they left it behind to find another distraction. It did not take long for the phenomenon to present itself under a new aspect, moving away from the domain of simple curiosity, drawing the attention of serious persons. We initially say that the reality of the phenomenon found many contradictors; some, not taking into account the honor and uninterest of the experimenters, did not see anything more than a clever and deceitful game. Those that do not admit anything beyond matter, that only believe in the visible world, that think that everything dies with the body, the materialists, in one word; those who consider themselves strong spirits, rejected the idea of the invisible spirits as something from the field of the absurd fables; they called mad all those who took it seriously, throwing sarcasm and mockery at them. Others, incapable of denying the facts, and prejudiced by certain ideas, attributed the phenomenon to the exclusive influence of the devil, thus trying to scare the timid away. Those became, unwillingly though, agents of promotion and the more they screamed the more efficient they were. The other critics were not more successful because they could only oppose to the attested facts their categorical reasoning with denials, personal opinions empty of contrary proofs, based only in ignorance and lack of serious observation of the facts. Their whole argumentation is summarized as this: “I don’t believe, thus it does not exist; every one that believes is crazy and it is only us that have the privilege of reason and common sense”. The communications through raps were slow and incomplete; it was soon recognized that by adapting a pencil to a mobile object: basket, planchette or another way on which one would place their fingers, that object would move, tracing characters. Later it was realized that such objects were purely accessories which could be dismissed; experience demonstrated that the spirit, that acted upon an inert body, voluntarily leading it, could also act upon an arm or a hand, to lead the pencil. We then had the writing mediums, or persons that would write involuntarily, under the impulse of the spirits, of whom they could be instruments and interpreters. What are these spirits? What is their role in the Universe? What is the objective of their communication with us mortals? Such were the first questions that were necessary to solve. It was soon found out, from them, that they were not separated beings from the creation, but the very souls of those who lived on Earth or in other worlds; that those souls, after having left their corporeal involucre, inhabit and occupy the space. There was no possibility of doubt when, among them, one could recognize friends and relatives, with whom they could establish a conversation; when they came to bring proofs of their existence, demonstrating that death for them only happened to the body, that their souls or spirits continued to live, watching and observing us as when they were alive, surrounding the loved ones with solicitude, and whose memory is a sweet satisfaction to them. Text adapted from Allan Kardec, Spiritism in its Simplest Expression.